I’ve enthused over the tactile properties of porcelain before, not least in the form of third rail insulators. The item above is an insulator too, although it’s a lot smaller (about 12cm tall). The copper wire is the clue; this is a railway telegraph insulator from the London Midland & Scottish Railway. According to the markings on its top, it is a model number 1, and was manufactured in 1941 by Bullers Ltd. The telegraph system has variously been described as the Victorian Internet (as here) and the Railway of Thought (as here), and it grew up alongside the actual railway. If the railways were the first paradigm-disrupting world-shrinking technology, the telegraph was the second. The railways brought goods from far away within much easier reach, and could also carry information in the form of mail, at speeds previously unimaginable. The telegraph allowed the transmission of information (but only information) even more rapidly as electric current flowed along copper wire at speeds approaching the speed of light; apart from the slower business of getting the message to or from the telegraph office in the first place. The telegraph was originally invented to solve a problem that the railways had created for themselves, namely how to get information to and from distant signalboxes to allow signallers to properly regulate train movements. Early experiments were carried out in Britain in the first half of the nineteenth century, at locations such as Euston (although the system didn’t catch on at this point, being replaced by an air-and-whistle system – I kid you not). The first really successful railway telegraph was installed between London Paddington and West Drayton on the Great Western Railway. It was slowly extended and its importance as a means of communication beyond railway needs was graphically illustrated in 1845 when a message was passed to London from Slough allowing a suspected murderer to be apprehended on arrival. At first, telegraph wires were buried in conduits, but this swiftly proved unsatisfactory as the insulation deteriorated. The solution was to use uninsulated copper wires run through the air, and supported by poles. That’s where the little chap in the picture above comes in. The electric current that carries the telegraph messages is desperate to return to earth, as all electric current is wont to do. 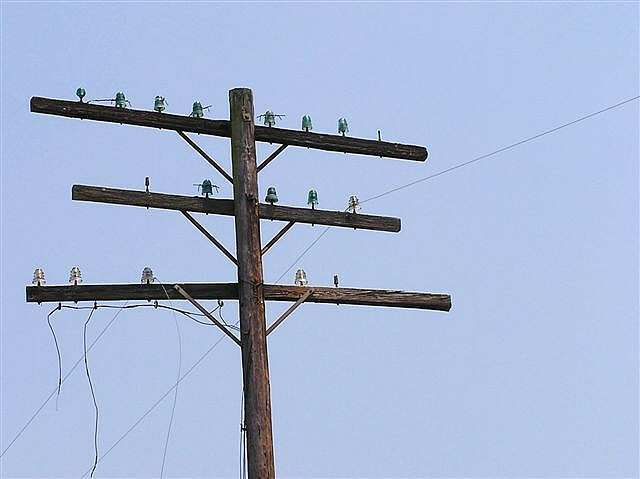 To stop it doing so at the telegraph poles, the copper wires are supported on insulators like the one above. 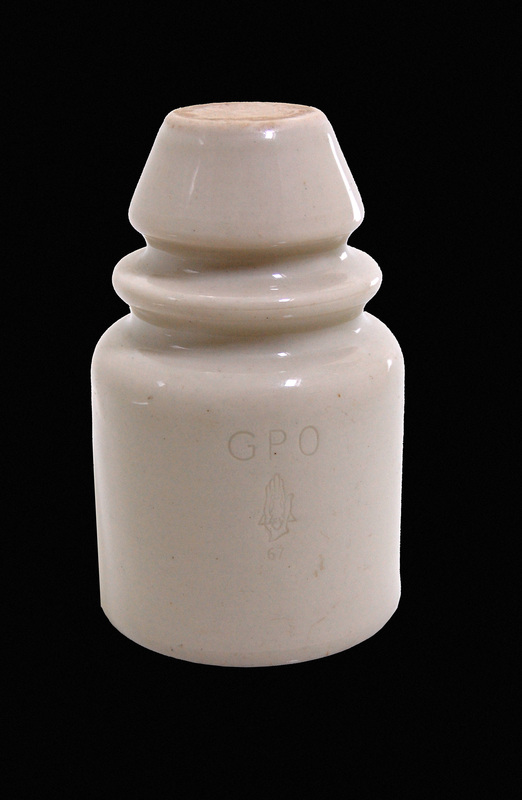 Porcelain is an insulating material, though when it rains electric current could flow through water on the outside. To combat that, the insulator is shaped with an outer ‘skirt’ (‘shed’ is apparently the preferred term as you can see here) and an air gap between the outer shed and the inner shed, where the insulator attaches to a metal bracket on the wooden telegraph pole. Soon, the telegraph was spreading along most railways in the country. It served not only railway needs for internal messaging and signalling control, but public message transmission as well, which had started at Paddington as early as 1840. Telegraph companies soon realised that if they were to connect up towns and cities around the country, they would need corridors along which to run their wires. The railways were the perfect solution. They already ran where the wires needed to go, and the railway companies needed to put up telegraph poles anyway for their own telegraph needs. 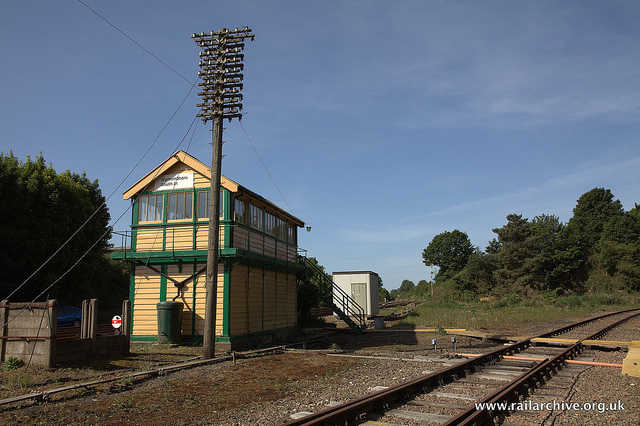 The telegraph system has vanished now, superseded by other technologies both for public and internal railway message transmission, and for railway signalling control. What is easy to forget today is the visual impact it once had. It was an integral part of the railway scene; railways used to be a lot easier to spot in the countryside, marked out by long lines of telegraph poles. Look at old railway photos and you’ll soon come across ones which show the telegraph poles at the edge of the track. They look for all the world like stylised bare trees, with branches full of little white birds. There were some very impressive constructions where larger numbers wires were needed (see here and here, for instance), and they crop up in contemporary transport art as well, such as this painting by Lucien Pissarro. Nowadays, apart from the odd survivor which hasn’t been felled, it’s only preserved railways where the copper wires still run. 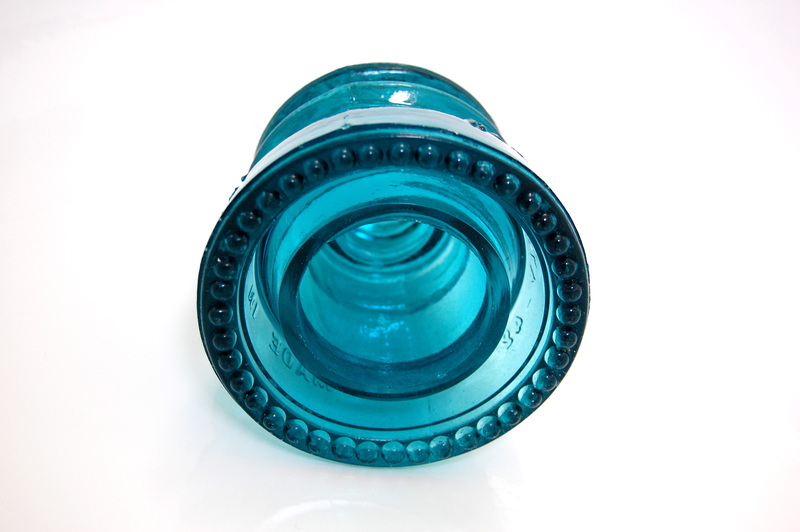 This teal-coloured insulator is a Hemingray 42, produced by the Hemingray Glass Company of Muncie (Indiana). 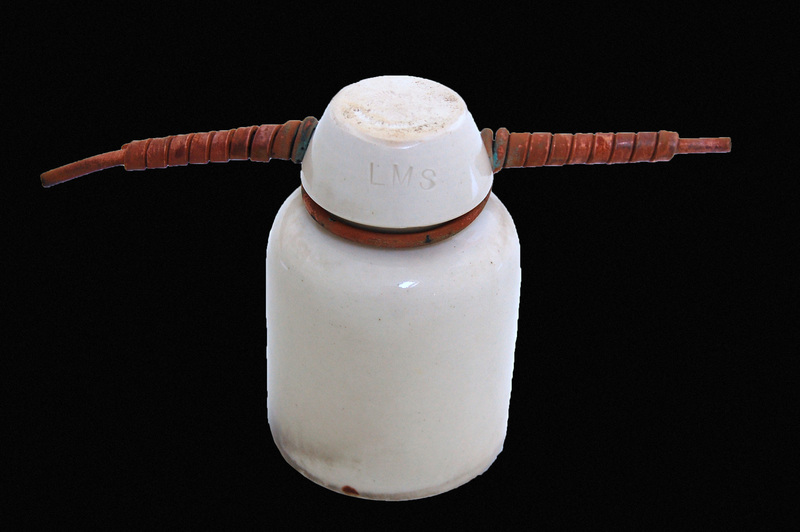 It is one of the most common models of telegraph insulator produced in America, not that its ubiquity detracts from its aesthetic qualities (you can see an online museum dedicated to the Hemingray company here). Like British telegraph insulators it has an inner and outer shed at the bottom (petticoat is the American term) and an air gap between the two. However, unlike British telegraph insulators, there is a ring of Dalek-like moulded hemispheres around the bottom of the insulator. These encourage condensation or rain on the insulator to collect and drip off, drying the insulator faster than it otherwise would, and avoiding current leakage. What a brilliant piece of design. 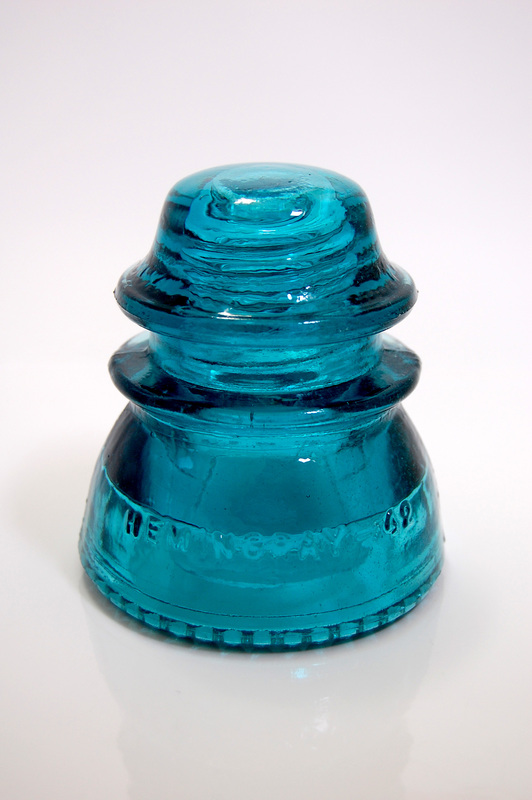 For reasons I’m not entirely sure of, American telegraph insulators came in a variety of colours (you can see the colour varieties employed by Hemingray on this collectors website, and more details of glass insulators on this one). The railroad telegraph poles also survive in greater numbers than they do in Britain, even though they are often no longer in use. Seen from an Amtrak train, with the sun behind them the insulators light up like fairy lights, in mesmerising fashion. I’ve never seen anything quite like it on my railway travels. 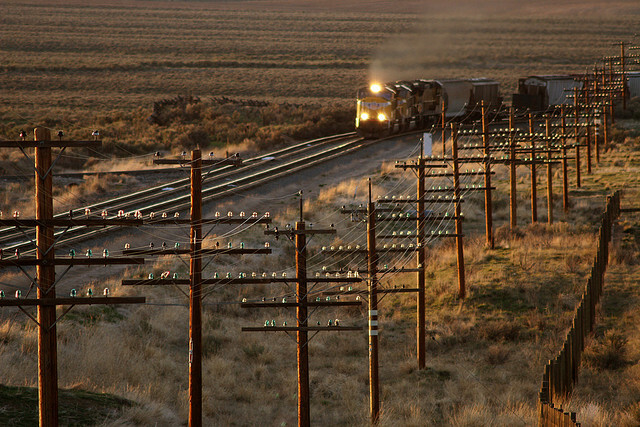 As in Britain, American railroad telegraph poles have generally fallen out of use, although some, complete with glass insulators, are still in some sort of railway employment on the Union Pacific line west of Denver (and possibly in other places and on other railroads, too). The majority, however, stand like shattered scarecrows at the edge of the railroad track, their copper viscera flailing. As monuments to the memory of the world’s first information superhighway, I doubt you could do better. In a single structure these once-proud structures and their glass menageries capture the rise and fall of the world’s first great information transmission system. British Telecom’s Connected Earth online history resource was very useful on the history of the telegraph, here. Distant Writing is a website specialising in telegraphic history which also provided very useful background. See it here. The gallery of obscure objects of transport beauty would not have acquired the insulators illustrated in this article without the assistance of regular reader JW of Liverpool. Many thanks.